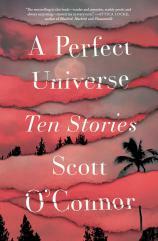 The 10 stories in Scott O’Connor’s A PERFECT UNIVERSE emphasize our ability to endure and hopefully overcome suffering. We never see these characters get to the top of the mountain, but we hope they do, or at least find a better world after all they have gone through. Several of the stories are exceptional, though each one has something to say, and even the few duds still ring with importance. The two standout entries are “Golden State” and “Interstellar Space,” the latter of which hinges on horror but stays grounded enough to be flat-out unsettling. “Interstellar Space” introduces readers to two sisters who grow up together in the 1950s. They play a number of odd games, including Prisoner, where they take turns duct-taping each other’s mouths and interrogating one another. For first person narrator Cate, this is all fiction. She goes on to become a screenwriter, and her job is to create stories out of real life. But the tale really revolves around her sister, Meg, who at the age of 10 starts hearing noises and voices. Soon it’s apparent that she has a serious condition, and when she is found passing out flyers in her town that read “...I have been bombarded with signals and instructions since I was a child…. I am asking for your help,” she is admitted to a mental hospital. "The two standout entries are 'Golden State' and 'Interstellar Space,' the latter of which hinges on horror but stays grounded enough to be flat-out unsettling.... O’Connor gives readers memorable stories and is considerably a hidden gem among writers." The ending is especially haunting. Is Cate using her sister to enhance her own fiction? Or is Meg scarred from the games they played as a child? Perhaps Meg was influenced by her father’s work on “satellites” and “rocket ships.” There is much for readers to consider here. In “Golden State,” a young boy with long hair named Claire moves across the country to start a new life with his mother, Diane, in Glendora, California. Claire befriends an older neighbor, Mr. Bartlett, and takes on the responsibilities of washing his truck and cleaning his yard. Claire invoices for his work and is paid every week. Diane is single and starts dating, leaving Claire by himself, but the two seem to have a lasting bond. She dreams of being on “The Price is Right,” which is why she came out to California. They name the prices of items at the grocery store, and it is Claire who eventually pushes his mother to go on the show. However, the heart of the story seems to be in the connections found, and how one can endure through the lessons they are taught. But this is perhaps best shown in the opening story, “Hold On,” about a man named Robert Castillo who works for the phone company in Los Angeles. He cleans and services pay phones, but when they end up being obsolete, his job then becomes to remove them altogether. One morning, though, an earthquake hits, and he is buried alive for three days in debris before a mysterious woman from the post office volunteers to help and finds him. Robert recovers over the next several months, but has trouble sleeping. Soon the psychological damage of being the only survivor starts to weigh on him, and he acts out in strange ways. The ending is oddly touching and will make readers think long after the story has ended. These are unique stories. You don’t always read about such conditions so delicately, and O’Connor seems most interested in exploring not how or why people end up scarred and damaged, but rather the interior of the soul, and how they cope and overcome. The implication here is that the walk to the mountain --- and to the top of it --- is secondary to the climb and the struggle itself. Not everyone makes it to the top, but those who do may find their strength from an unlikely source. That’s how A PERFECT UNIVERSE plays out. O’Connor gets into your imagination and let’s it crawl, fill in the gaps, and consider what may come next. The real answers ultimately may not be as interesting as the crafted pieces laid out for our own imagination to follow. O’Connor gives readers memorable stories and is considerably a hidden gem among writers.